Oboist Jared Hauser has been described as "melodious and spontaneous" by ArtsNash, and as a "sensitive, elegant soloist" with a "subtle refined style" by Gramaphone Magazine. Hauser maintains an international stature as performing and teaching artist, and was appointed to the faculty of the Blair School of Music at Vanderbilt University in 2008, where he serves as Associate Professor. A great proponent of new music, Hauser has commissioned, premiered and recorded numerous works by many of today’s brightest composers. Recent premieres include works by Libby Larsen, Augusta Read Thomas, Paul Moravec, Peter Schickele, Michael Slayton, Michael Rose and Stan Link; and consortium premieres of works by John Harbison and Bill Douglas. Hauser is currently on the teaching faculties at the Interlochen Center for the Arts and the National Music Festival. He performs with the Blair Woodwind Quintet, the Nashville Opera’s orchestra, and Nashville-based contemporary music group Intersection. He also performs on historical oboes with Music City Baroque and other early-music groups across the southeastern United States. An active recording artist, Hauser has released several highly acclaimed solo and chamber music CDs for BGR and Naxos, and can also be heard on recordings from Koch International, AUR, Gemini, Warner Brothers and Eroica Records. His performances have been broadcast on NPR’s Performance Today, CBC/Radio Canada and BBC Radio 3. 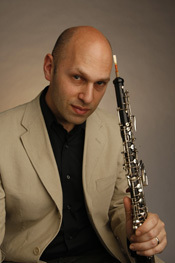 Hauser’s orchestral credits include principal oboe of the Orlando Philharmonic Orchestra, the Palm Beach Opera Orchestra, and appearances as guest principal with the Orchestra Camerata Ducale (Turin, Italy), the symphony orchestras of Detroit, Atlanta and Houston, and solo engagements with orchestras across the United States. Prior posts also include serving as artist faculty at the Lynn Conservatory of Music, SUNY-Potsdam, and the Hot Springs Music Festival. With degrees from the Oberlin Conservatory, Rice University, University of Michigan, and Michigan State University, his principal teachers were James Caldwell, Alex Klein, Robert Atherholt, Dan Stolper and Harry Sargous. Hauser is a Yamaha Performing Artist.